With the Kramer 8155/8155L, Kramer is further expanding its broad product portfolio in the wheel loader sector. 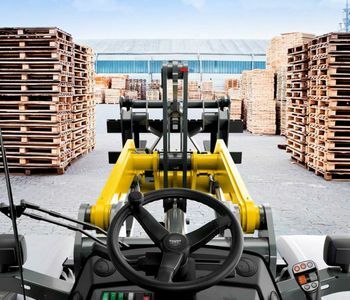 The power rating of the wheel loader is complemented by the typical Kramer all-wheel steering, which ensures stability, manoeuvrability and compactness. In addition to the impressive performance features, the wheel loader also impresses with a completely new cabin and operating concept. The two models meet the current exhaust emission level IV and are state of the art in every respect. The 8155/8155L belongs to the 8-series, the Premium series from Kramer. The cabin concept of the 8155/8155L has been completely redesigned. 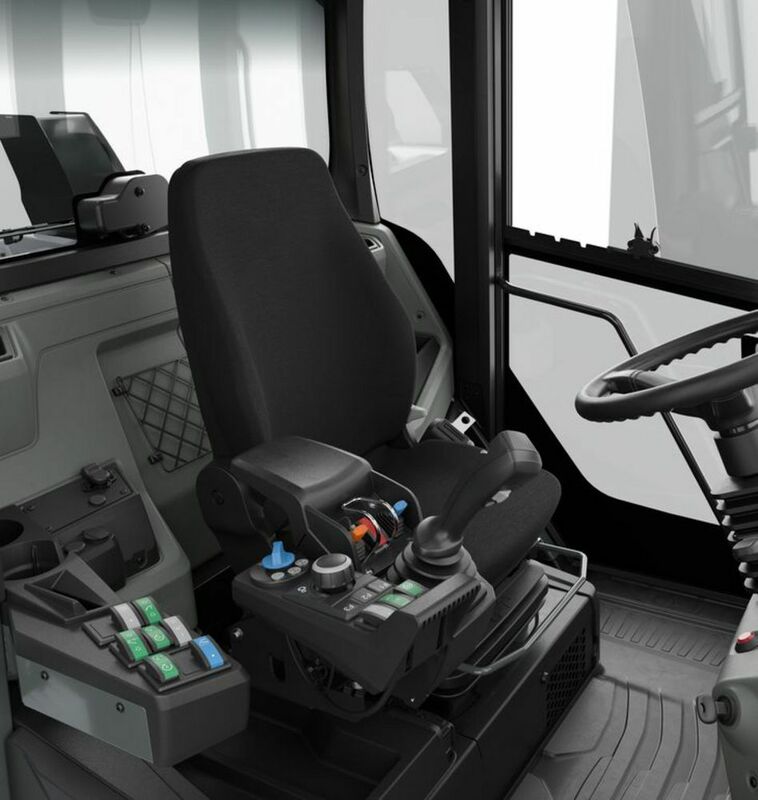 From the operator’s seat to the steering wheel, all details were consequently aligned with your needs. Ergonomics, driving comfort and functionality were at the centre of the redesign. The fully glazed cabin is spacious and features considerable headroom and legroom. 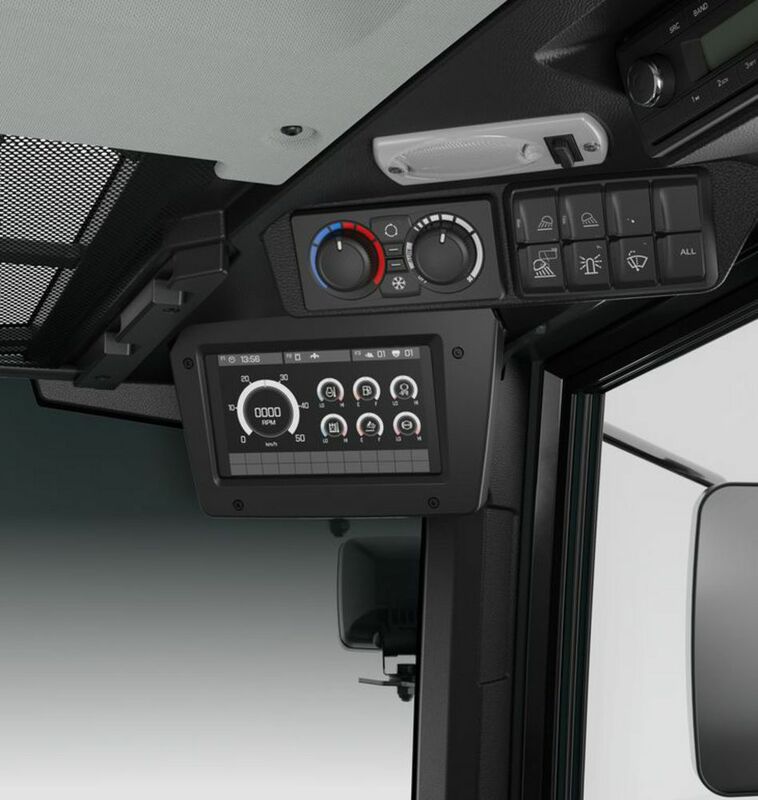 The easy-to-see and ergonomically designed dashboard also allows for an unrestricted view of the quickhitch headstock. 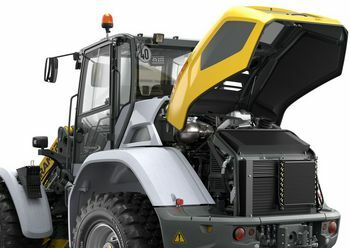 In summary, the cab offers a comfortable environment with excellent all-round visibility for fatigue-free and efficient work, even over long workdays. The wheel loader has a completely new operating concept with a large 7" LCD display. The setup of the 7" display is simple and intuitive. All important vehicle data and functions are shown in the main menu. The brightness can be adjusted and customised to your needs. Große Glasflächen in Verbindung mit offengestaltetem Glasdach und der integrierten Rückfahrkamera bieten in der neuen Kabine eine ausgezeichnete Rundumsicht: einen hervorragenden Blick auf das Anbaugerät, den unmittelbaren Arbeitsbereich und die gesamte Maschinenumgebung. The cabin is equipped with a jog dial controller. This makes it possible to easily set all important machine settings, such as the oil volume of all control circuits. The most important operating data can be shown with the rotary and push wheel and adjusted entirely to the operator's needs. 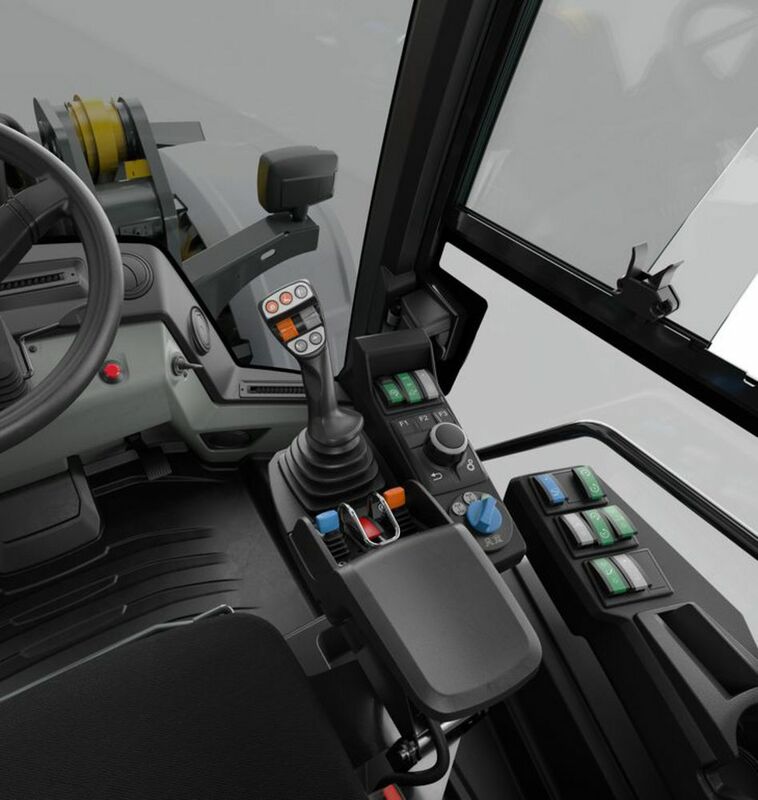 The armrest, including the joystick console and jog dial, is attached to the operator’s seat and equipped with the most important operator’s controls. The left hand can therefore remain on the steering wheel while the right hand is in the armrest area. The armrest folds up, making it possible to exit to the right. Durch das Kabinendesgin wird der Fahrer vor Geräuschemissionen (69 dB(A)) geschützt. Desweitern ist im Dach über dem 7-Zoll Display die Steuerung der Klimaautomatik, Arbeitsbeleuchtung und Wischeranlage angebracht. Weitere Kabinenmerkmale sind: Bluetooth-Radio mit Freisprecheinrichtung, 12 V-Steckdose mit Schutzkappe, zwei USBAnschlüsse uvm. The new Kramer flagship is powered by a 100 kW Deutz TCD 3.6 engine of exhaust-gas stage IV. The exhaust aftertreatment occurs via DOC and SCR (a DPF is optionally available). The even more powerful Deutz TCD 4.1 with 115 kW is available to you as an option. Here, the exhaust gas is treated with DOC, DPF and SCR. The wheel loader has two different loader units available, depending on the requirement. 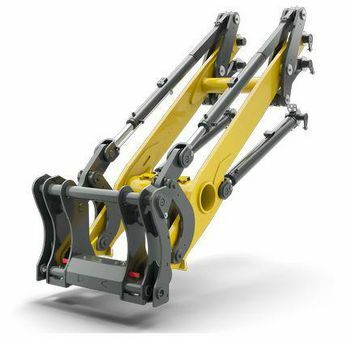 Of course an extremely sturdy hydraulic quickhitch facility is offered here for the harshest applications with a 61.5 mm wide locating pin as well as a 50 mm thick lock pin. The standard and industrial quickhitch systems have the support as per ISO 23727, which is used most frequently around the world in this performance category. The PZ-mast combines the best of parallel and Z-kinematics in one system, guaranteeing a high breakout torque and an exact parallel over the entire lifting range. The mast ensures an exemplary view of the attachment as well as the load, thus ensuring excellent manoeuvrability of them. The P-kinematics impress in practice with a high breakout force, high holding forces in the upper range of the mast and exemplary precision when working with heavy loads. 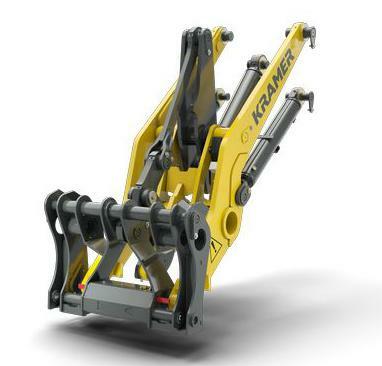 The view of the attachment is exceptional thanks to the open design of the loader unit. This advantage can be felt in particular when loading and unloading as well as stacking with high lift heights. Kramer co-developed the continuously variable hydrostatic transmission with 45° turning angle of the hydraulic motor. It impresses with maximum economic efficiency combined with the best possible environmental friendliness and excellent driving characteristics. Thanks to the ecospeedPRO transmission, the speed and pushing power are always perfectly matched to each other. The new powerful transmission makes continuous acceleration possible from 0 to 40 km/h without shifting. This results in a comfortable uniform driving manner, since there are no tractive force interruptions or shifting jerks. The ecospeedPRO transmission offers an even greater increase in tractive force than the previous ecospeed version. Even higher pushing power and tractive forces of up to an additional 10% are thus achieved. The Smart Driving rpm reduction is included as a standard in the hydrostat version as well as in the ecospeedPRO version. The undivided vehicle frame forms the basis for three different types of steering. A wheel loader’s design principle decides how it is used and for which applications. The steering system is the crucial factor here. Why split what belongs together? The Kramer brand stands for all-wheel steer loaders, telescopic wheel loaders and telescopic loaders with extreme manoeuvrability, all-terrain mobility and high efficiency. The Kramer wheel loaders impress with their high level of stability thanks to the time-tested and proven, undivided vehicle frame. Due to this special vehicle setup, there is no shifting of the centre of gravity through steering movements. Only the wheels move when steering due to the Ackermann steering. Accordingly, a high level of safety is a given even on narrow curve radii, on uneven ground conditions and with maximum payloads.